Stripes are so versatile, lending themselves to more than just the standard vertical and horizontal courses. This season, they burst with life in all directions: diagonally, criss-cross, or interchanging. Stella McCartney makes this style her own with layers of knit striped fabric, creating a colourful optical illusion. Tommy Hilfiger is on board, too, with mixed colors, and Jonathan Saunders places his on airy silk fabric. The ultimate effect is a layered and textured version that is perfect for the winter months. From uniform lines to traditional tartan plaids, this geometric and clean trend lends elegance and a touch of movement to holiday imagery. Pear Tree is grabbing this theme and marching it off the runway and onto our unique Christmas cards. Make this linear style a part of your holiday decor in subtle and sophisticated ways. 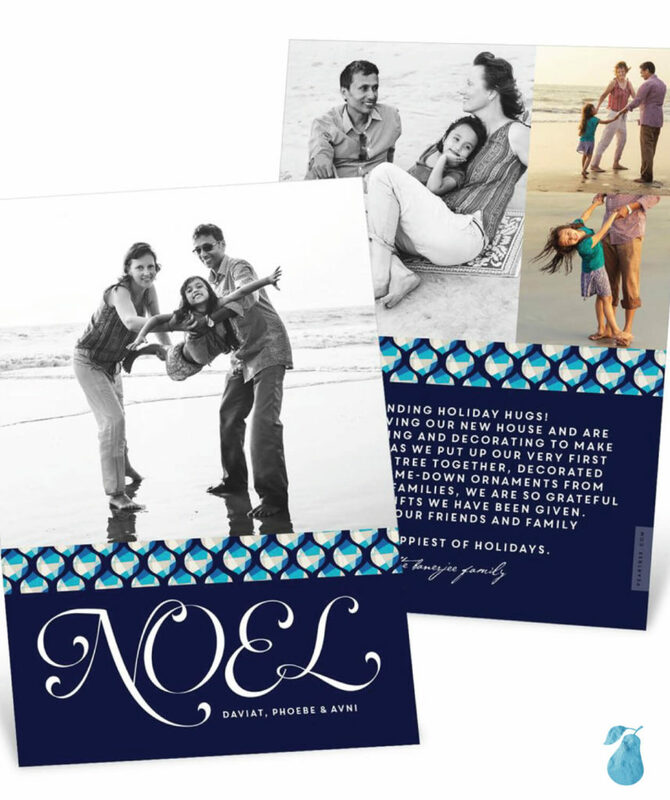 Our design team has found a variety of fun ways to work stripes and lattice patterns into our Christmas cards. Check them out in bright colors, handwritten strokes, and luxe textures. Each style bursts with energy and adds something new to the holiday season. The Bands of Gold template takes traditional horizontal lines and adds glamor and edge with faux gold foil and stark black contrast. 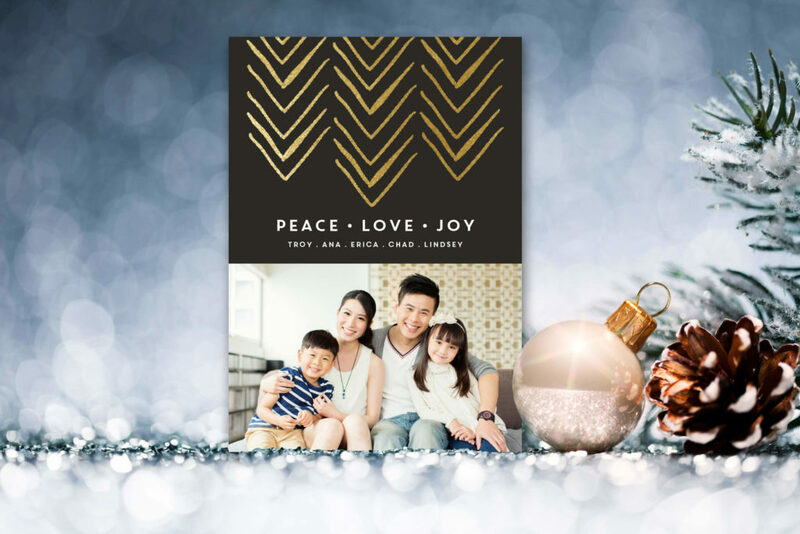 This card is elegant in its simplicity, letting your photos be the star. 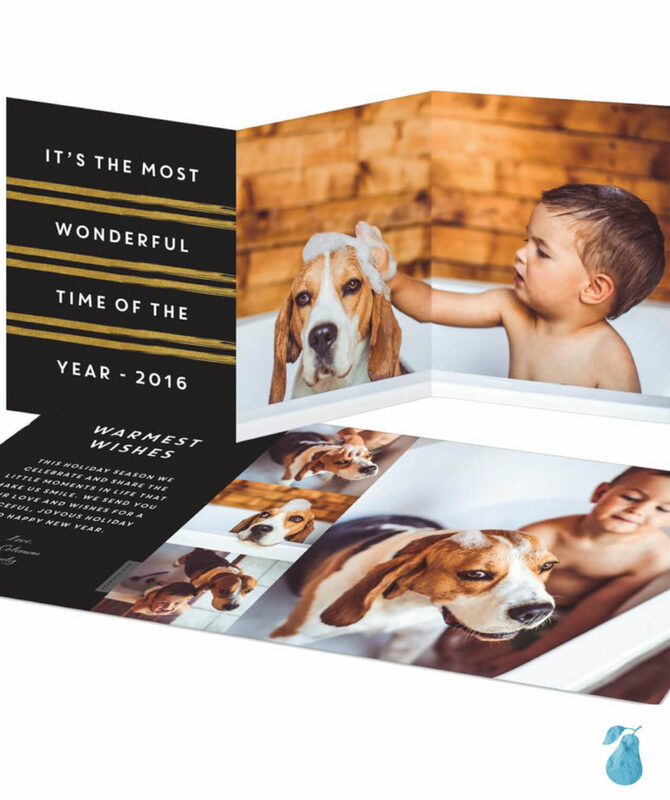 The stripes combine beautifully with the trifold design, which adds extra space for personalization. There’s nothing standard about the painterly stripes on our New Colors card. It takes the dynamic movement of stripes and adds freshness, vivacity, and bold colors. 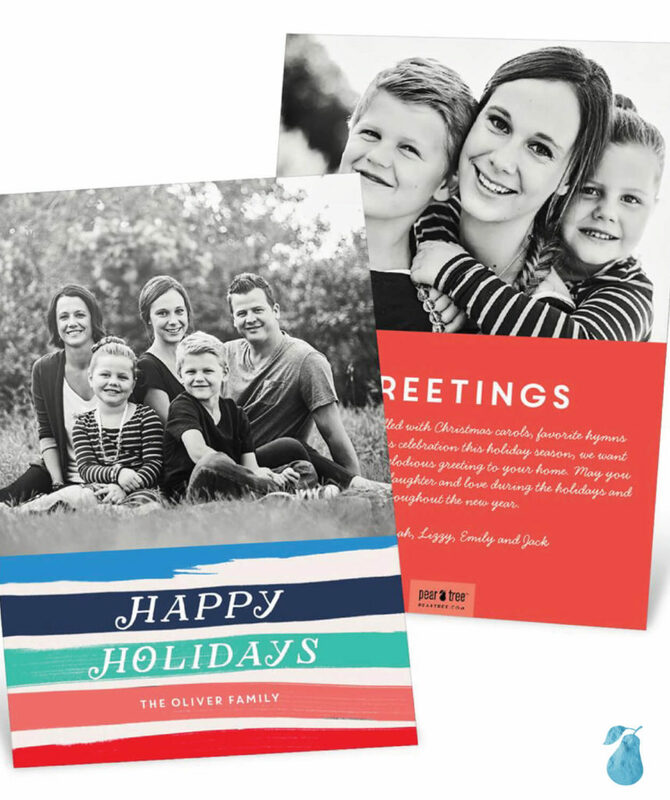 The multi-choice options on this design allow you to create a truly custom card that is stylish and energetic. You can choose a backer color that matches one of the stripes on the front, or opt for something different that complements your photos. Our Mix It Up design takes a new twist on this trend, adding some geometric elements to its striped band. These fun ornament shapes are simultaneously modern and classic in your choice of shades. The script font keeps it seasonal and focused on its simple lines and your fabulous photo. The Faux Foil Direction card puts another spin on stripes, featuring arrow shapes The faux foil on the front and natural texture on the back are unexpected complements to each other, mingling luxe style with a grounded feel. 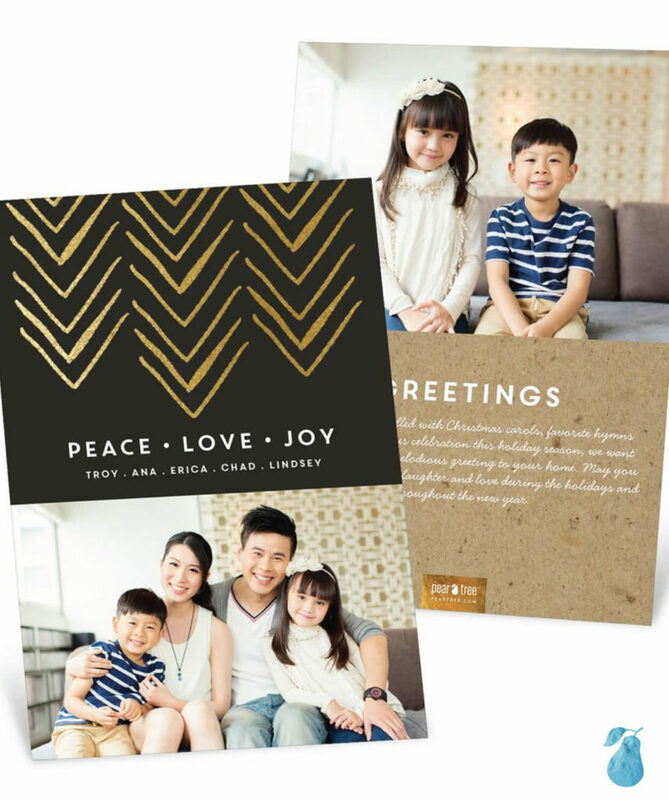 From gold and glam to warm and whimsical, these cards are sure to make a big impact on your loved ones’ mantles.